Why is the French finance minister invoking other cultures’ diplomatic style to defend France? France is apparently adopting China’s non-interference mantra within the EU debate. There cannot be topics that are vital to the EU’s ultimate success that are then declared off limits. France wants the benefits it can derive from the EU without the related standards. German worries are getting louder, given that France is failing to live up to its fiscal targets. It is precisely because France postponed reforms for so long that it is digging an ever-deeper hole. Chinese leaders have long been famous for their mantra-like reference to the principle of non-intervention in other nations’ domestic affairs. The typical line from the country’s Foreign Ministry is something very close to the phrase “mutual respect, equality and mutual benefit and non-interference,” often repeated multiple times in a single statement. Noble as that sounds, the point of stating this is not really the officially stated reason (creating more sovereign space for other nations). The real purpose is to have a diplomatic vehicle available to fend off moments of potential unpleasantness in the international realm. With that remark, he tried to fend off recurring German criticism – no matter how polite – of France’s persistent lack of a reformist spirit in the management of its economy. Mind you, an open debate about each other’s economic and fiscal performance is part and parcel of having moved to an economic and monetary union – as the Eurozone countries very much have. Among close partners, there really cannot be topics that are vital to the EU’s ultimate success that are then declared off limits by a government currently having trouble performing (as previously advertised by itself). Whatever drove the French finance minister to issue his China-style warning, Germany and France are neighbors – and have been keeping very close watch on each other for centuries. They are hardly cultures alien to each other. As remote as Franco-German relations sometimes still are after decades of EU integration, it’s definitely not like China and the EU. That fact did not keep Monsieur Sapin from warning the Germans. In fact, beyond the China “non-interference” defense, he also stated that there is a need in Europe to “respect” each other. Contrary to Mr. Sapin’s sentiments, criticizing a long-time partner is actually a sign of respect. That’s what friends do for each other – telling each other the truth and trying to help each to improve their respective lots. Mr. Sapin’s drawing a line in the sand via the “respect” motif is all the more surprising as Germany and France – and indeed much of the EU – have a long history of using the (better) performance of the other at a given time as a motivating tool in the domestic debate to do better in the future. That deliberate shame and blame-game mechanism (blame Brussels, blame Berlin, whatever it takes to build a domestic reform coalition) has been deployed many a time in order to get the holdout nation to move at long last. 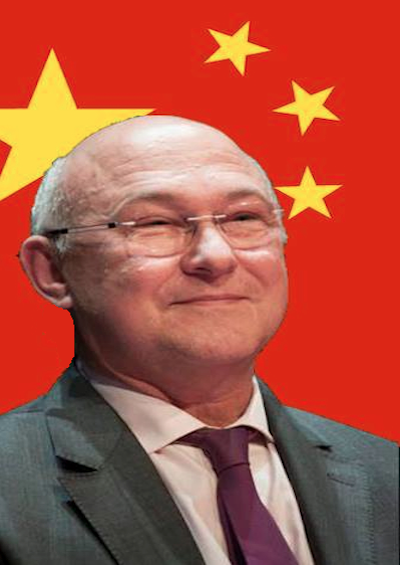 Mr. Sapin’s claim that what is needed is “to respect each others’ history, national identity and points of sensitivity” – if indeed intended with the absolutist rigor that he seems to be conveying – is an obvious non-starter. It cannot have any place among nations that have vowed to move into an economic, monetary and political union. The German worries are getting louder, given that France is even failing to live up to its fiscal targets. Overshooting the budget deficit criterion of 3% by half the target — current European Commission forecasts for the 2015 French deficit are in the range of 4.5% – do give Germans reason to pause. Generally, the French may not be doing so swimmingly on structural reforms, but – ENArques administration that they are – they would at least manage to do the right thing on the budget. Not so anymore. Sapin’s final trump card is to argue that German criticism of France’s performance is helping “extreme parties grow.” That sounds like an important point to make. After all, who would want Madame Le Pen to take an ever-larger share of the French vote? Unfortunately, Sapin’s argument in this regard does not really hold water either, for one simple reason: Ultimately, it is the persistent lack of courage of launching reforms in France – a malperformance that both major political parties in France are co-culpable for – that has led to Le Pen’s rise. The far right may well argue that benefit cuts are forced on France by Europe. If only that were true. In reality, France still benefits greatly from its eurozone membership, not least via very low interest rate spreads. More important, the money for merrily doling out benefits just isn’t there anymore – EU or no EU. Financial markets will quickly put an end to it, if they get convinced that France can’t change course. For now, they are still hopeful. It is precisely because the French have postponed reforms for so long that they are digging an ever-deeper hole for themselves. If anything, it is an act of outright cowardice by Mr. Sapin, and all who spin this tale of brewing hyper-nationalism, to blame Germany for what is the consequence of French elites’ very own unwillingness to do what needs doing. At present, France is at least a decade late to launch the reform process. The later it starts, the longer it will take to get the economy growing again. A growing economy, though, is the prerequisite to have the public means to support those who really need public support as demanded by the post-industrial far right (and their forebears on the industrial far left). French leaders may blame the Germans all they want. But raising now the specter of Germany bringing the ghosts of Weimar over today’s France is a blame-shifting attempt far too transparent and straightforward to be convincing. On a final note, maybe what’s really going on in France is a good guy-bad guy routine. According to this school of thought, the Sapin rhetoric is probably designed partly to score points with the Socialist Party’s left wing, letting them vent some steam. After all, French economics minister Emmanuel Macron has just presented his reform program. It is pretty modest, but in the statist politics of France still a step forward. Sapin’s real point may have been to close party ranks a little in what will be Prime Minister Valls’s fight of his life to get that program through the French parliament.